Cider – The Most Misunderstood Drink on the Bar? A woman walks into a pub. If that sounds like the first line of a joke, you’re right but this one is a bad joke. She asked for a cider but was served with a glass of beer. When she pointed out the barman’s mistake he responded condescendingly ‘Beer and cider – it’s the same thing’. That unfortunately is a true story. I know, I overheard the conversation. I doubt that he is the only one who is clueless about cider. I regularly hear and read people referring to cider breweries. Cider is not apple beer and is not brewed. It is made in a cidery by pressing apples and fermenting the juice. Like wine is with grapes. https://www.jane-peyton.com/wp-content/uploads/Apples-2.jpg 618 2200 Jane Peyton https://www.jane-peyton.com/wp-content/uploads/jp-logo-sharp.png Jane Peyton2019-02-17 17:53:002019-02-19 15:44:46Cider - The Most Misunderstood Drink on the Bar? 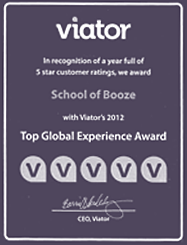 In 2008 I founded a business called School of Booze to educate about and celebrate alcohol. I never would have imagined that a decade later I would be doing so much work connected with Low or No Alcohol. 10 years ago I would also never have believed how dynamic the No-Low sector would be in 2018 with small businesses creating a variety of imaginative and most importantly delicious and satisfying No-Low libations and one-stop on-line shops such as Wise Bartender to sell them. I do hear sarcastic comments from some people along the lines of ‘What’s the point’, ‘Cardboard’, and ‘I’d rather drink water’. Those are the people who may once have tried Kaliber beer in the 1980s and still regret it. 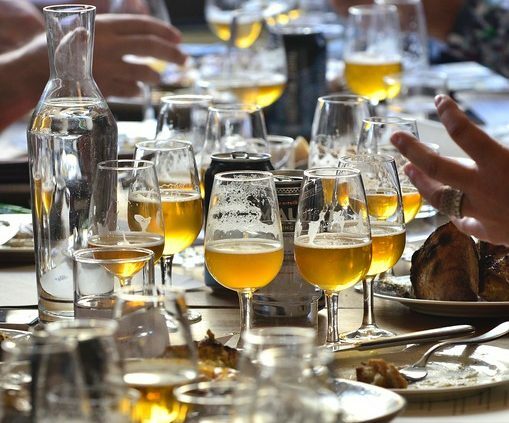 When I received an invitation to visit the Mahou Brewery in Madrid in July 2018 I knew barely anything about the company and had never tasted its flagship beer Cinco Estrellas. In the UK I am probably not alone, although there can be few people who do not know another hugely popular brand owned by Mahou– San Miguel. Mahou (pronounced Mow) is Spain’s largest brewing company with its beers in 60 countries. It also owns the Alhambra brand, plus stakes in Spanish craft brewer Nómada Brewing and the influential Founders Brewery in the USA. ‘Big Beer’ I muttered to myself when I learned these facts. But then I spent a couple of days in Madrid with members of the brewing and marketing teams and had the full Mahou experience. It started with a visit to the gargantuan main brewery, then on to the company’s stylish brew-pub Espacio Cervecero where I helped to judge the food and beer matches created by catering students sponsored by Mahou, followed by dinner at the fabulous Street XO restaurant for some stunning food matched with exemplary barrel aged lagers (more of those later). It ended with some gentle head-banging at the Mad Cool music festival. I was smitten. A few years ago I was quoted in the Daily Telegraph about how the shape of glassware enhances specific characteristics in beer and that the ugly pint glass had no place on a dining table because it was one of several reasons why in Britain beer was widely perceived as declassé. The editor of the Op-Ed column, mentioning that I had said beer was a brilliant match for food, wrote that I was ‘utterly wrong’ and that beer should only ever be consumed in the pub and ‘if sustenance is needed a scotch egg or pork scratching will suffice’. I wrote to the letters page defending my opinion and offered to arrange a battle of the bottle meal where wine and beer were served so the Op-Editor, who I shall call Mr Cholmondeley-Feathestonehaugh, could decide which was a better match. He did not accept the challenge. Around the same time I had written a blog for the Huff Post in which I fantasised that Buckingham Palace would offer beer to match the dishes at a State Banquet held in honour of President Barack Obama. Of course it remained a dream. In reality President Obama is much more likely to enjoy a beer state banquet than Queen Elizabeth is because he lives on Planet Beer and in beer and food matching particularly, America is the leader of the free world. Imagine life without the pub. Where would we go to meet friends, flirt with prospective lovers, escape to, commemorate special occasions, put the world to rights, unite to watch our footy team be victorious, and find refuge when we are alone and need to be with other people? There is a reason why every soap opera has a pub. They are places for communal activity where storylines develop and cast members have valid reasons to interact. 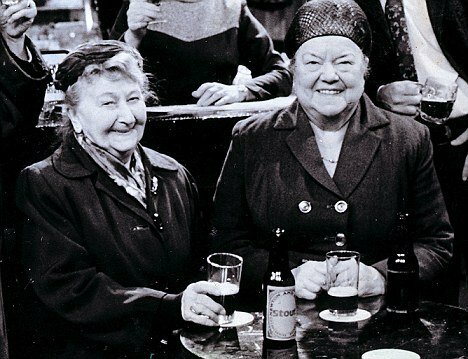 I have Coronation Street and the Rovers Return to thank for showing to me as a 7-year old how marvellous the pub is. Watching the characters gossiping and being convivial had a deep impact. I am fortunate to come from a family that also reveres pubs and as a child my extended clan would regularly gather in the pub for what we called ‘a jollification’. Soft Power is the ability to attract without coercion. Hard power makes no one fall in love with you. For decades Britain was the world’s number one soft power projecting cultural and diplomatic authority. The British Council exists to spread knowledge of British culture and make friends and influence people. That is why the BBC World Service formerly funded by the Foreign and Commonwealth Office is so effective at winning hearts and minds. Even the motto of the BBC communicates soft power ‘Nation shall speak peace unto nation’. But the UK is leaving the EU and the world order is changing. Apart from the anxiety about trade deals there is hand wringing a-plenty in private with the very real fear that Britain could well be Billy No Mates. Existential crisis begone! For Britain is in possession of the ultimate soft power trappings in the guise of beer and pubs. Can there be a more magnificent libation than beer? For thousands of years, beer was a staple of the diet for the whole family, children included. It was a safe source of drinking water, supplied valuable nutrition, and the microflora it contained strengthened the immune system. Beer drinkers were resilient, vigorous, and the soluble nutrition they ingested increased brain power. How does nature reward such fine specimens? By making them more attractive to potential mates. Humans had discovered the magical elixir that fed, watered, fortified, gave them a social life and increased their opportunities to go forth and multiply. And a new phrase entered the lexicon – beer goggles.